FREEbie: Personalized Video Email From Santa!! You are here: Home / FREEbies / FREEbie: Personalized Video Email From Santa!! This is very fun and has many options available! You can get a FREE video message from Santa to your kids, grandkids, nieces, nephews, even adults! You get to choose from so many different options. Santa will use their name and even a picture if you upload one – he will mention the state they live in, show them a book with their name in it and their description and what their favorite things are – it’s very realistic for them! He even shows them around his office and workshop! You can choose from all of the customizations and then see the video yourself before it is sent by email. 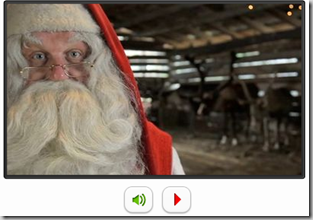 You can make your FREE personalized Santa video now! Thanks Stockpiling Moms!